Lightsey added, "But what really drew our attention to this animal was the fact that it seems to have been feasting on the cattle on my farm, because mutilated body parts were found in the water. It was a monster which needed to be removed." The alligator weight approximately 800lb, requiring heavy equipment for its removal. 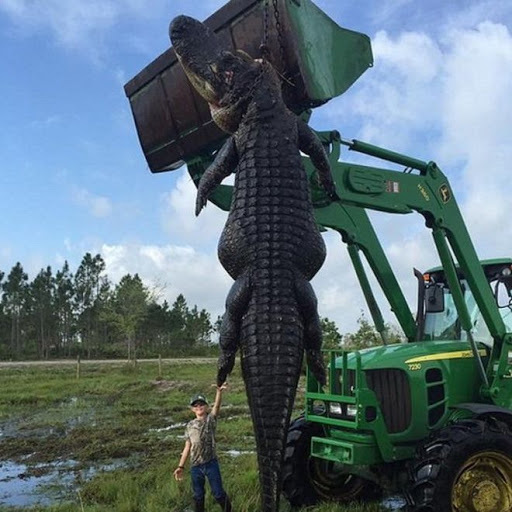 (360kg) alligator that was feasting on his farm's cattle. Lightsey's company, Outwest Farms, offers guided hunts for alligators, boar and turkey. The biggest alligator previously killed measured just a little over 13 feet. He charges $10,000 to kill an alligator larger than 13 feet, or $4,500 to kill an alligator between 10-12 feet. Most hunters use high-powered rifles to kill the beasts. "But always we kill them with the minimum of suffering without allowing them to be injured before they die," he said. Hundreds of alligators are available. Lightsey has been commercially hunting alligators since 1988 and more than 5,000 alligators bigger than 5 feet long have been harvested since then.